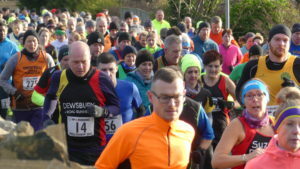 Meltham 10k is a hilly, small local 10k race in January – similar in course and atmosphere to the SYCAA 5 milers, but much colder and it costs money. I’d done Meltham once before, having unwisely picked it as my brother’s first ever 10k race a couple of years ago. Main advantages are it’s cheap (£10 to the club, £1.50 online booking fee), well organised and the last mile and a half is great, plus it gets your racing legs moving early in the season. Disadvantages are it’s cold and windy, and I’m nesh. Got there in a bit of a rush, pulling up at 9:05 for a 9:30 start time. No problems finding street parking even at that late stage. I had packed ALL the clothes but for some reason decided to take them off and leave them in the car, heading to the hall to pick up my number in vest and shorts. I quickly panicked when I realised it was absolutely nithering, then saw a hall full of people in tights, hats, gloves, snoods and base layers. Picked the number up, ran back to the car, changed into long sleeve base layer under vest, hat, gloves and shorts – that proved to be a good choice and I never felt too hot or too cold. The start was simple and well organised. 2-3 minute briefing then we were off. The course was well marshalled. Next to zero support, other than marshals and mountain rescue volunteers, but that wasn’t a surprise in January. The course itself is split into four distinct parts: 1) big hill to start, with a brief 400m flat bit in the middle. 2) rolling bit along the tops, nice views. 3) medium length (3/4 of a mile?) uphill to wear you down, then about the same back downhill, then about half a mile at 7% back up. Definitely the hardest of the four parts. 4) Lovely long downhill (over a mile) back into Meltham, then a short ~200m kick up to the finish. A couple of miles in, the field had thinned out and positions were relatively stable. At this point I picked out my race nemesis – an athletic-looking veteran with a wiry mop of grey hair who was a couple of places ahead, and who unlike me had toughed it out in a bright yellow vest and shorts only. We quickly established a leapfrogging pattern: every time the road went up I came past him, and every time it went down he sailed nimbly back past again. I still can’t explain why it was that way round, considering I’m 6’2” and 95kg, and this guy was probably 5’9” and 70kg tops. Coming up the final hill in section 3, I gradually made up ground and overtook him, but knew I had to put some distance between us with that long downhill to finish – I must have topped the hill with about a 5 second lead because he came past about halfway down it. Things were looking bleak but I resolved to stay with him if possible, then beat him on the uphill sprint to the line. I tracked him for another couple of minutes downhill, before I sensed him slowing down and overtook ~100m before the bottom of the hill. I kept a decent pace up to the finish and held him off. Found him after the finish and shook his hand to acknowledge what had been a momentous unspoken head-to-head contest. One for the ages. Overall it was a fine way to spend a cold, windy Sunday morning in January, and a good start to my road season. Bring on the 2020 rematch!